Japan is a large group of islands located between the North Pacific Ocean and the Sea of Japan. The five main islands are Honshu, Hokkaido, Kyushu, Skikoku, and Okinawa. Honshu contains the capital, Tokyo, as well as many major industrial areas. Rugged mountain chains containing several active volcanoes account for more than 71% of Japan's total land area. Most of the countryside is covered by dense forests, leaving little land for farming. 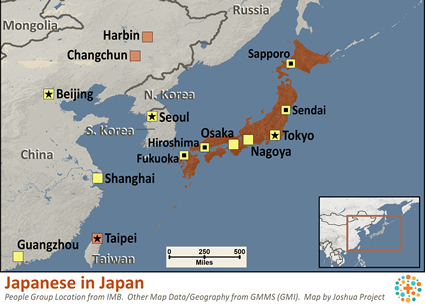 Japan is subject to numerous earthquakes, typhoons, and monsoons. Racially, culturally, and ethnically, the Japanese are one of the most homogenous people groups in the world. They identify themselves in terms of biological heritage, birth in Japan, a shared culture, and a common language (Japanese). One group, the Burakumin, speaks a unique Japanese dialect. Society considers them undesirable outcasts-"untouchables." Sixty percent of the Japanese live in nuclear families, while slightly over one-fifth live in extended family units, or ie. The ie consists of a three-generation household of grandparents, parents, and children. Japanese couples are free to choose their own marriage partners; however, many marriages are still arranged. The divorce rate is one quarter of that in the United States. Japan's economy is based on a competitive market/private enterprise system. Many families farm as a secondary occupation. Typically, the wife tends to the farm while the husband works full-time in a business or industry. Rice remains the principal crop, though its production is strictly controlled. Other sources of income include livestock production, fishing, shipbuilding, foreign trade, scientific research and technology development. Traditionally, Japanese buildings are made of wood with deep projecting roofs as protection against the monsoons. Rural Japanese homes are built with a joined skeleton frame of post and beam construction. The floor is raised above the ground with its posts resting on a foundation stone, which allows the structure to bounce during earthquakes. In cities, most people live in apartments or housing corporations. 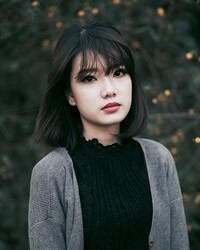 Many men, women, and children enjoy wearing Western clothing for their daily activities; however, traditional costumes are worn during special religious ceremonies or festivals. Japanese women are also often seen wearing their traditional silk Kimonos. The uniqueness of Japanese culture can be seen in their art forms, which include the highly refined flower arrangements ('ikebana'), tea ceremonies ('cha-no-yu'), calligraphy, and puppetry. The theater of No and Kabuki have also remained. Traditional and Western forms of recreation include baseball, Sumo wrestling, judo, karate, table tennis, fishing, volleyball, shogi (Japanese chess) and go (a complicated game of strategy). Gardening is the most popular hobby of both men and women. Traditions of Shintoism, Buddhism, Confucianism, and Taoism have all contributed to Japanese religious principles: ancestor worship; a belief in religious continuity of the family; a close tie between the nation and religion; a free exchange of ideas among religious systems; and religious practices centered on the use of prayer meditation, amulets, and purification. Many Japanese are indifferent to and skeptical of established religion. On the outside, they seem to have few needs. However, many have become obsessed with materialistic pleasures, careers, and possessions. Their greatest need is to be introduced to the Father through His Son, Jesus. * Ask the Lord to call laborers to go to Japan and share Christ with the Japanese. * Ask the Holy Spirit to soften the hearts of the Japanese toward Christians so that they will be receptive to the Gospel. * Pray that Christian radio and television broadcasts will be effective in reaching the Japanese. * Ask the Lord to raise up strong local churches among the Japanese.View Japanese in all countries.